My primary use for a computer is to play Solitaire. This provides a constant reminder that my brain power, my ability to think, to work out programs and solve problems, is vastly superior to a machine's ability to operate the program. Thus I win 97 per cent of the time. Beat that, stupid machine! 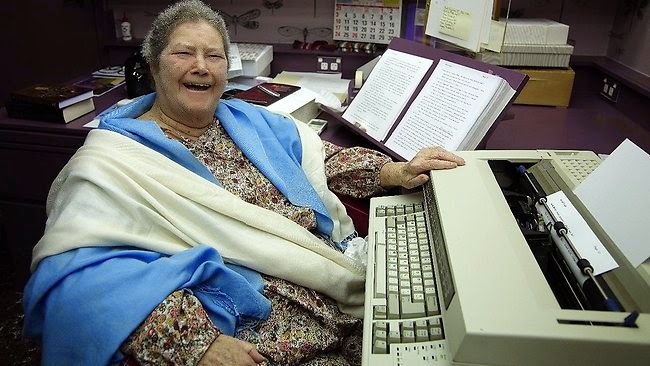 Australian author Colleen McCullough died in hospital on Norfolk Island today, aged 77. McCullough was born in Wellington, New South Wales, on June 1, 1937. Her mother was a New Zealander of part-Māori descent. McCullough's best-known work was The Thorn Birds. Before entering tertiary education, she had earned a living as a teacher, librarian and journalist. She worked as a neuroscientist in Royal North Shore Hospital in Sydney. In 1963 she moved to Britain and then spent 10 years from April 1967 researching and teaching in the Department of Neurology at the Yale Medical School in New Haven, Connecticut. 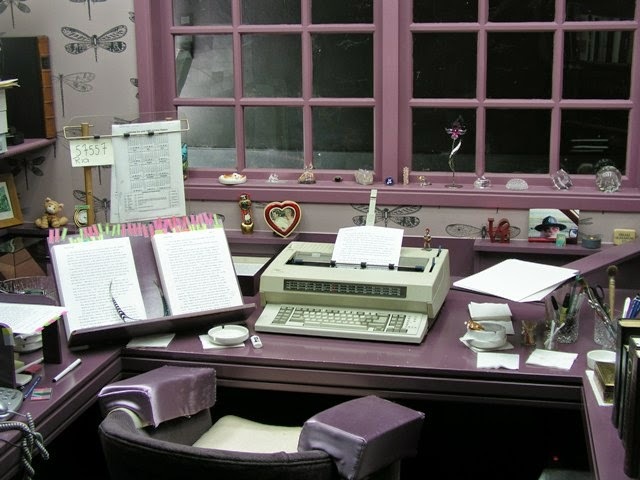 It was while at Yale that she wrote her first two books. One of these was The Thorn Birds, which became an international best seller and in 1983 a popular television mini-series. 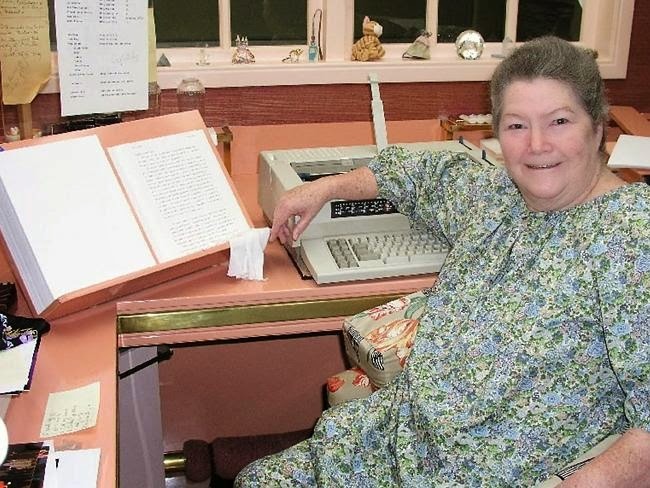 In 1980 she settled in the isolation of Norfolk Island, a small island in the Pacific Ocean situated between Australia, New Zealand and New Caledonia, 880 miles directly east of mainland Australia's Evans Head. The island is part of Australia. Associated Press's report on the final scheduled round of the epic 1965 United States Open golf tournament at the Bellerive Country Club in St Louis. Gary Player beat Kel Nagle in an 18-hole playoff. 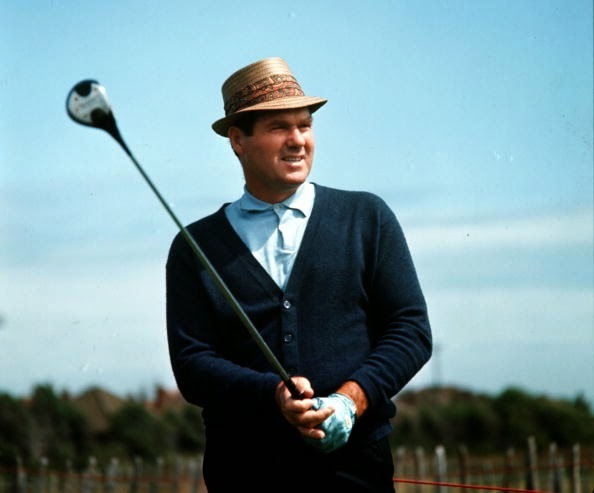 With his win, Player joined Gene Sarazen and Ben Hogan as the (then) only golfers to win all four professional major championships, the career Grand Slam. 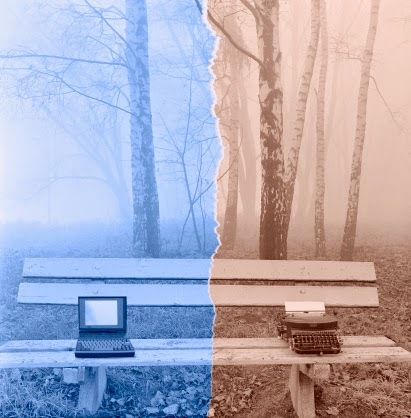 I do hesitate to raise sporting matters on a blog generally dedicated to typewriters. 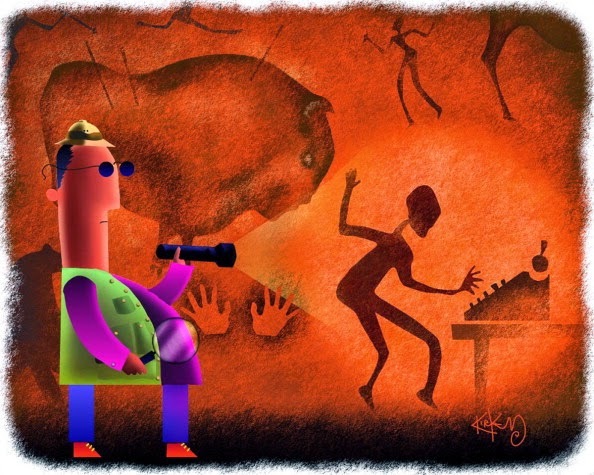 I fear most Typospherians find sport as boring as dog do. 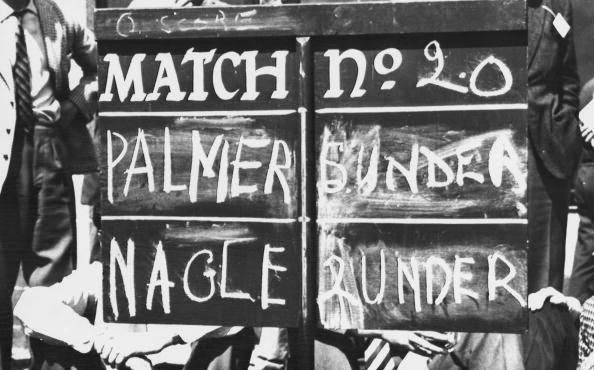 However, I simply cannot resist mentioning the death this morning, at the age of 94, of the great Australian golfer Kel Nagle, winner of the 1960 Centenary British Open at St Andrews. Of all the people I've met through typewriters these past 16 years, perhaps only Diane Jones's partner Steven Harrison has been game enough to express an interest in golf (and in his case, I must admit, an intense interest). The reason I want to write about Kel Nagle now is that, in all the outpourings of grief, the tributes and the gripping yarns about him that will appear online from across the world today, not one - this post aside - will mention one of Nagle's greatest golfing achievements. You see, this achievement does not appear anywhere in Nagle's astonishing and well-documented record of golf performances. It was not a tournament he won, and he won plenty (60, quite aside from the Centenary Open). Instead, it was a tournament in which he lost a play-off to Jack Newton, at Kempsey, New South Wales, on March 11-12, 1972. I know about this achievement because, unlike any other past or present golf writer anywhere in the world, I was there and I saw it. I alone covered the event, for this country's national daily, The Australian, using an Olivetti Lettera 32 portable typewriter. Since back copies of The Australian have not yet been digitised by the National Library of Australia, and do not appear online on its extensive Trove site, my stories about what Nagle did in Kempsey in 1972 are not accessible on the Internet. Ergo, even if a more enterprising journalist decides today to go beyond Wikipedia and the normal range of Internet sources to write an obituary for Nagle, he or she will not find this absolute gem. And believe me, it is something which should be included, in every obituary about Nagle. Here, at least to me in these circumstances, is a prime example of why original, typewritten and printed copy remains invaluable to recording history - whether it be sporting or any other kind of history. 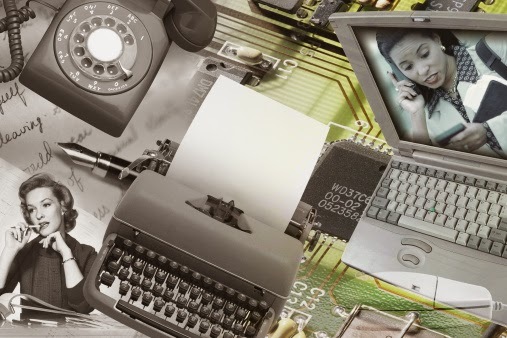 The fact that it may not be digitised must in no way diminish its importance. I'll be as brief as I can. In early 1972 there was a falling out between the Australian Golf Union and the Australian Professional Golfers' Association (PGA) over the right to schedule professional tournaments in this country. All our golf clubs are, naturally, affiliated to the AGU, which means the AGU exercises control over all of our championship golf courses. When, in 1972, the PGA refused to continue to cede the right to schedule professional tournaments to the AGU, the AGU barred all PGA members from all courses in Australia. 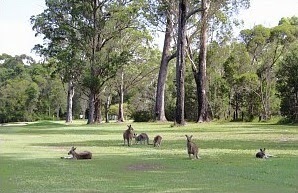 The Kempsey Golf Club made a very brave decision. It decided to go ahead with its pro-am on March 11-12, 1972. In doing so, it knew full well it would be disaffiliated and its facilities barred to rank-and-file golfers by the AGU. A large number of professional golfers, including Nagle, Newton and the fabulous Billy Dunk, made the equally brave decision to play at Kempsey. They too knew they could be barred from every course in the country. Nagle probably had much more to lose than most. Through the AGU's international affiliation, a ban on him could conceivably have extended beyond our shores. Newton at the time was still a young (22-year-old) up-and-comer. Dunk rarely ventured beyond Australia and New Zealand. But Nagle was still very much a major worldwide figure in golf. I must stress these guys didn't travel to Kempsey for the money. The pro-am had an (even then) paltry $2500 at stake. The pros went because they wanted to show solidarity, that they were backing their association on the issue in question. They believed that, as the players drawing the crowds and the sponsorship dough, they had a right to have a say in the scheduling of professional tournaments. Going to Kempsey, breaking the AGU boycott, was their way of standing up for that right. One leading Australian professional sided with the AGU - Peter Thomson. Nagle and Thomson were by far and away our two greatest golfers from the late 1940s through to the mid-1960s and the emergence of Bruce Devlin, David Graham and Bruce Crampton. 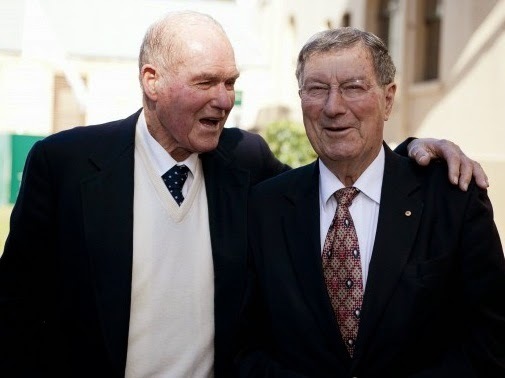 Thomson and Nagle were world beaters when few Australian golfers were in that class. I won't say here whether Nagle and Thomson were especially close, but I will say that Nagle's decision to go with his fellow PGA members to Kempsey would have unquestionably widened any gap that existed between them back then. Given that I had, virtually lone-handed, covered this dispute on a daily basis, all the while risking litigation from Thomson, The Australian made the decision to send me to Kempsey to cover the event, a decision no other Australian newspaper was prepared to make. To this day I'm glad it did. It remains one of my most cherished sportswriting memories. There was a certain poignancy in Newton, representing the immediate future of Australian professional golf, beating the old guard, represented by Nagle, in an event which had huge significance for the ongoing well-being of Australian golf. Aside from all that, without me and my Olivetti, the tournament might have gone unrecorded. It's still not online, but that doesn't mean it didn't happen. The unfortunate thing is that it won't get a mention elsewhere today, because it was a momentous occasion in Kel Nagle's long life and brilliant professional golfing career. He deserves credit for having the guts to do what he did back then. It was a huge risk, a threat to his livelihood. But Nagle had principles, strong ones, and that's what he should be remembered for now, as much as for his golfing successes. 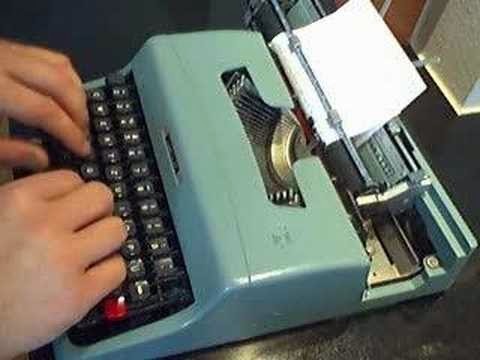 Thanks to a typewriter, one day that fact might be more widely known. 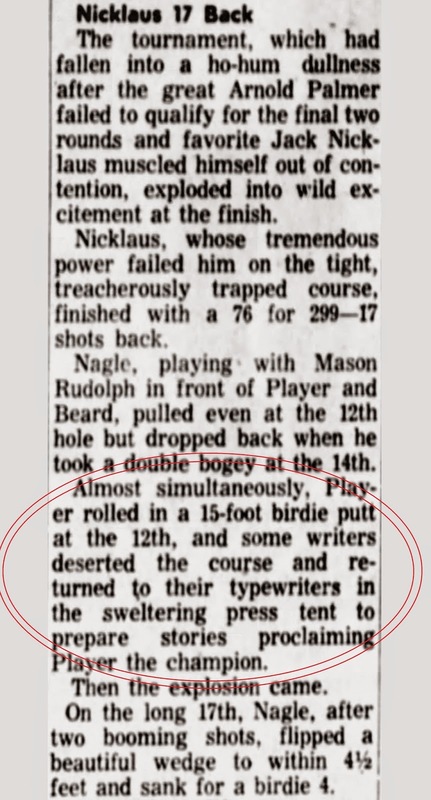 From the day when golf writers got out on the course, and didn't rely on computerised information being force fed to them back in the press tent. *Kelvin David George Nagle was born in North Sydney on December 21, 1920. He won at least one tournament each year from 1949 to 1975. 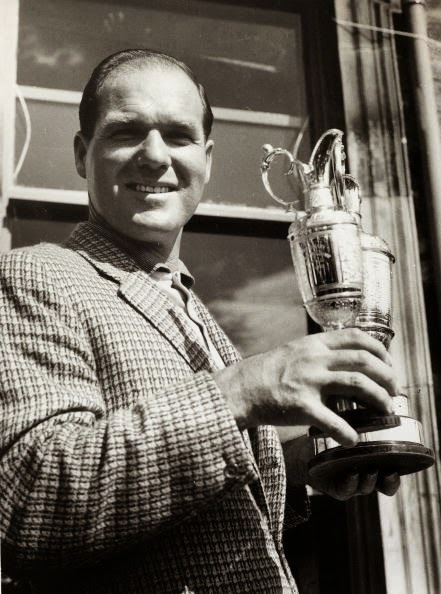 He won 61 tournaments in Australasia (next best is Greg Norman with 31), as well as the Canada Cup for Australia in partnership with Thomson in 1954 and 1959. At the 1960 Centenary British Open, Nagle beat Arnold Palmer, who edged out Nagle in the 1961 Open. As late as 1970, the year he turned 50, Nagle was ranked among the top 10 players in the world on Mark McCormack's World Golf Rankings. In July 2007, Nagle was elected to the World Golf Hall of Fame. 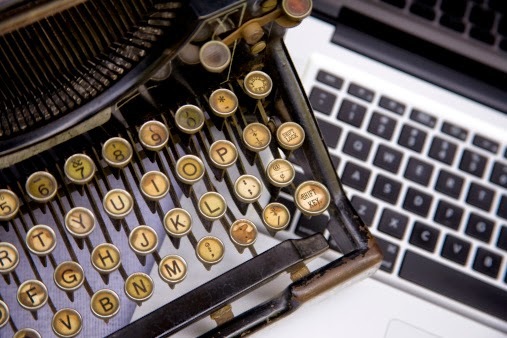 The death last week of Australian war correspondent Harry Gordon got me thinking about the extraordinary history of typewriter-wielding war correspondents and the plans to establish a memorial for war correspondents here in Canberra. 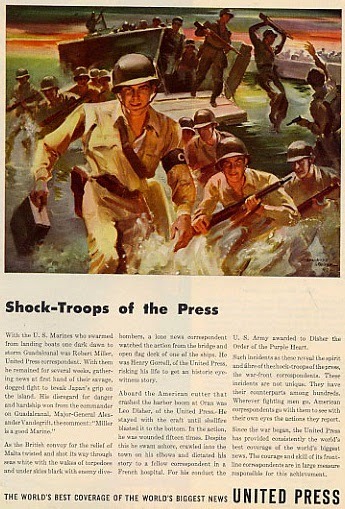 In the first half of 1943, many United States newspapers - at least those which were taking United Press's coverage of the wars in the Pacific, in Europe and the Middle East - ran this large advertisement describing UP's war correspondents as "Shock-Troops of the Press". 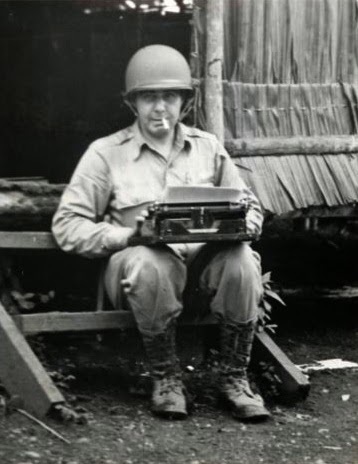 The artwork for the advert is supposed to represent United Press war correspondent Robert Carl "Bob" Miller carrying his typewriter in its case ashore at the storming of Guadalcanal. 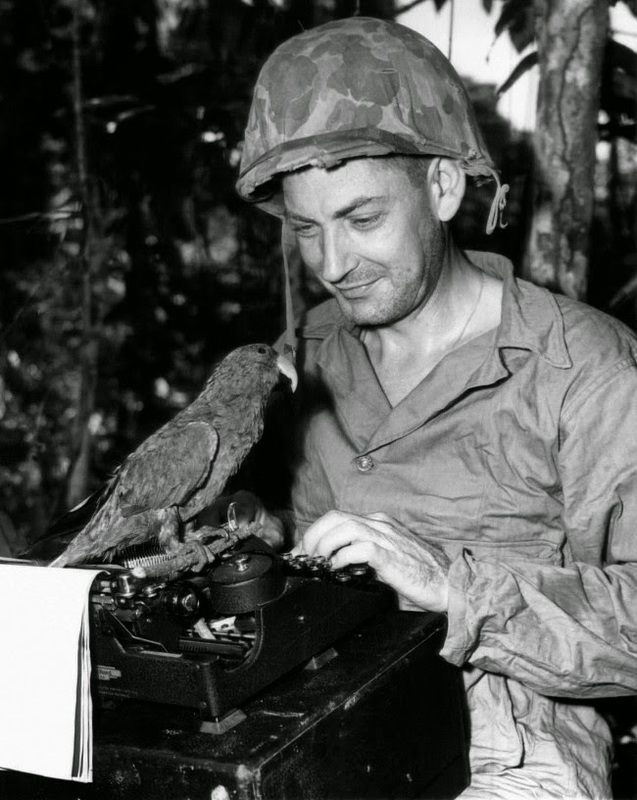 Associated Press war correspondent Charles H. McMurtry writes his copy on Guadalcanal on November 25, 1945, as his pet parrot Flags watches on. McMurtry acquired the bird at Treasury Island while en route from Bougainville to Guadalcanal. Charles Harold McMurtry was born on March 29, 1905, at Carthage, Missouri, where he graduated from the local high school. He died in Burlingame, California, on April 14, 1970, aged 65. After attending the University of Missouri from 1922-24, he was a newspaperman in Carthage and Jefferson City before joining AP in Kansas City, Missouri. In 1941 he was transferred to Los Angeles and spent most of World War II as Honolulu bureau chief and covering combat operations in the Pacific. In one incident he received severe burns as he pulled several sailors to safety during a kamikaze attack on the aircraft Hornet. His news dispatch told of the attack, but not his personal valour (see image below). McMurtry scored a scoop in reporting the death in a plane crash in Nevada of actress Carole Lombard in 1942. He was an AP correspondent during the Eniwetok-Bikini atomic bomb test in 1946, and helped cover the early astronaut landings near the Hawaiian Islands in the 1960s. The Guadalcanal Campaign, also known as the Battle of Guadalcanal and codenamed Operation Watchtower by Allied forces, was a military campaign fought between August 7, 1942, and February 9, 1943 on and around the island of Guadalcanal in the Pacific theatre of World War II. It was the first major offensive by Allied forces against the Empire of Japan. On August 7, 1942, Allied forces, predominantly American, landed on the islands of Guadalcanal, Tulagi and Florida in the southern Solomon Islands with the objective of denying their use by the Japanese to threaten the supply and communication routes between the US, Australia and New Zealand. In the months following the attack on Pearl Harbor in December 1941, the Japanese drove the Americans out of the Philippines, the British out of British Malaya and the Dutch out of the East Indies. The Japanese then began to expand into the Western Pacific, occupying many islands in an attempt to build a defensive ring around their conquests. The Japanese reached Guadalcanal in May 1942. When an allied reconnaissance mission spotted construction of a Japanese airfield at Lunga Point on the north coast of Guadalcanal, the situation became critical. This new airfield represented a threat to Australia itself, and so the United States, as a matter of urgency, despite not being adequately prepared, conducted the first amphibious landing of the war. The initial landings of US Marines on August 7, 1942, secured the airfield without too much difficulty, but holding the airfield for the next six months was one of the most hotly contested campaigns in the entire war for the control of ground, sea and skies. Guadalcanal became a major turning point in the war as it stopped Japanese expansion. After six months of fighting, the Japanese ceased contesting the control of the island. They finally evacuated the island at Cape Esperance on the north-west coast in February 1943. 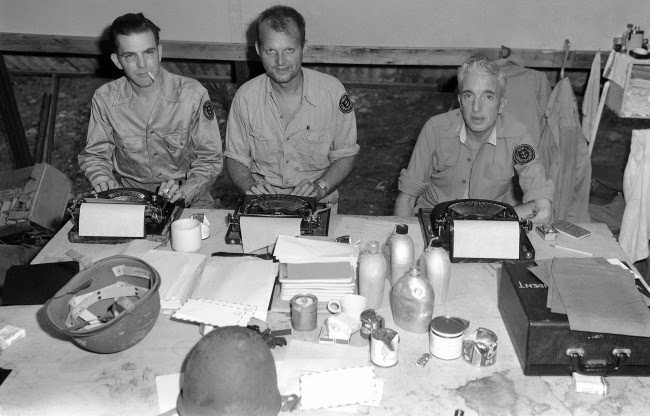 Art Burgess and Leif Erickson of Associated Press and Pat Robinson of the International News Service type their stories in the press hut on Guadalcanal on November 3, 1943. Robert C. Miller, known to fellow troops as "Baldy", was born on June 15, 1915, at Bound Brook, New Jersey, and died aged 89 on July 26, 2004, at Hilo, in Hawaii. He "turned up frequently on the battlefields of the world during 45 years". 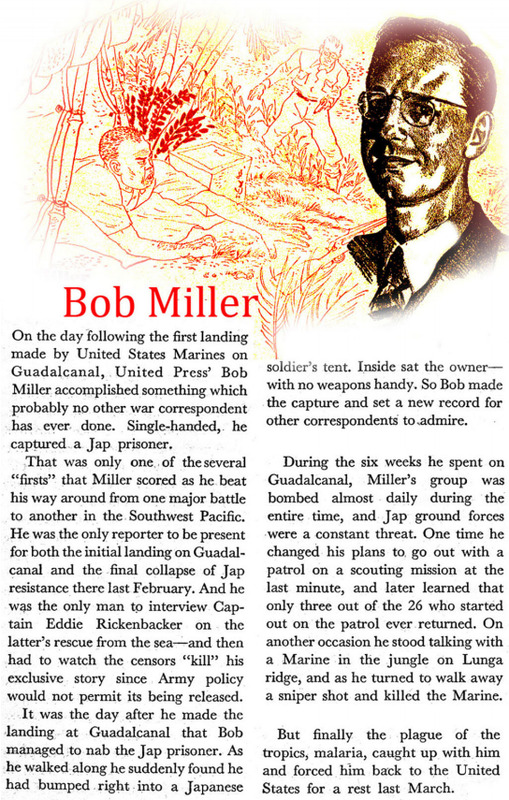 Miller roamed both the Pacific and Europe during World War II, and after the war his byline appeared on stories of conflict from the Middle East, Greece, India, Korea, Vietnam and Cambodia (where he was once captured by the North Vietnamese). "I have covered wars on every continent except Latin America," he said in a letter in 1982, requesting that he be sent to the Falkland Islands during the war between Britain and Argentina. 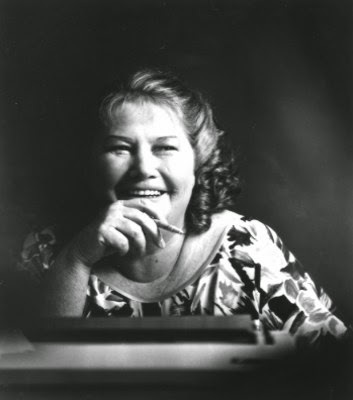 Described as a colourful writer and a great storyteller, Miller served in a number of UP bureaus as reporter and manager, including Honolulu, Los Angeles, Fresno, Phoenix, Alaska, Sydney (1979-81) and Tokyo. In addition to wars, Miller also covered the Panmunjom peace talks that brought an end to the Korean War and the 1970 Paris talks seeking to end the Vietnam War. Miller got his start with UP the day after he graduated from the University of Nevada in 1938, driving all night from Reno to Fresno in his Model A for his first day of work. He moved to San Diego five months later as the manager. Two years later he was reporting on Hollywood stars from Los Angeles, then he moved to Honolulu in early 1942 following the Japanese attack on Pearl Harbor, as UP built up its force of reporters throughout the Pacific theatre. Miller covered the battles of Midway and Guadalcanal, then returned to the United States in 1943 with injuries. In early 1944, Miller was one of 17 survivors of a US ship sunk by a German submarine in the English Channel. They floated in oily water for six hours before they were rescued. By June that year he was covering the invasion of Europe by Allied forces, including the liberation of Paris. Miller rode into Paris on the handlebars of a French civilian's bicycle. He was wounded again in September 1944, when at Verdun a piece of shrapnel tore into his right arm - he didn't worry, he was left-handed. He received the Purple Heart as a civilian. He returned to Europe in October 1945, to cover the Nuremberg trials of Nazi war criminals, but was forced to return to the United States because of wound complications. Miller said, "A reporter must never forget he is merely an observer, a recorder of facts, a heliograph dedicated to relaying as accurately, vividly and as graphically as his talents allow, the events he is privileged to witness. The millions who rely upon him for their knowledge cover the entire spectrum of society. He is their eyes, ears, yeah, even their nose, but never their adrenal glands. If a reporter is unable to view this crazy, idiotic, exciting wonderful world from this detached observatory, let him become an editorial writer, politician or pundit. His days as a reliable Unipresser are over." 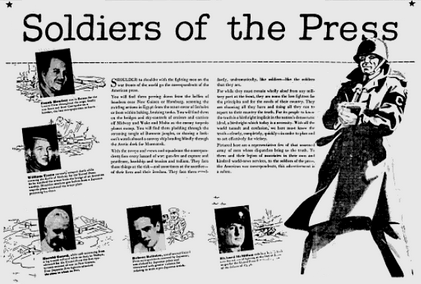 Other war correspondents were in this 1942 feature described as "Soldiers of the Press". This (partially) became the title of a book by another war correspondent mentioned in the wording under the UP Guadalcanal landing artwork. He was Henry Tilton Gorrell, a war correspondent for UP during the Spanish Civil War and World War II. Gorrell was born in Florence, Italy, on June 8, 1911. He become a reporter for the Kansas City Journal-Post in 1929, before joining UP in 1930. In 1933 he was assigned to the Buenos Aires office, then in October 1935, with the outbreak of war in Ethiopia, to the Rome bureau as assistant manager. But he was expelled from Italy in 1936 due to his reporting. Gorrell was part of the UP staff in Madrid during the Spanish Civil War. In 1936, he was captured by an "Italian tank crew and deported, by way of several jails" to France. 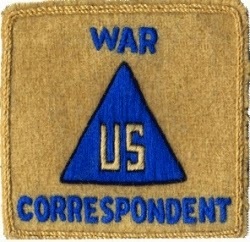 Gorrell was the chief reporter with American troops for UP as the United States entered the war. For his actions during an air mission in 1942, he became the first correspondent to be decorated in the Middle East during World War II and only the second correspondent to be decorated during the entire war. He was awarded the Air Medal for gallantry by order of President Franklin D. Roosevelt. He also filed the first report on the invasion of Normandy in 1944. On August 26, 1944, he was among the first, along with Ernie Pyle, to enter the city after the liberation of Paris. Gorrell followed the British army to North Africa and Palestine and finally he covered a very obscure aspect of World War II, the revolt of Iraq. 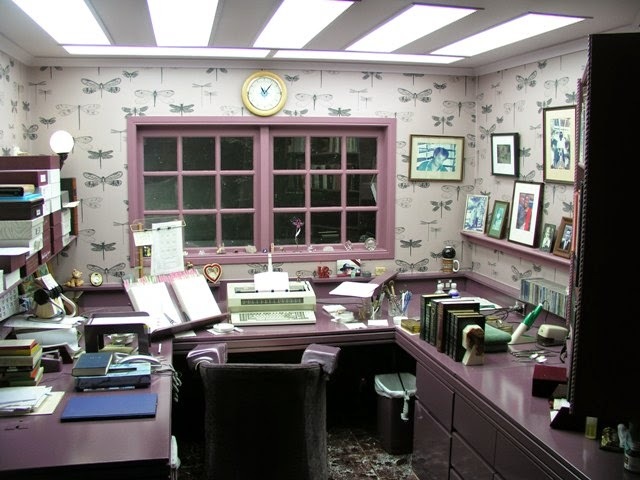 After the war, he left UP to establish and edit the Veterans' Report from 1946 until his death in Herndon, Virginia, on January 6, 1958, aged just 46. Gorrell's memoir, Soldier of the Press: Covering the Front in Europe and North Africa (1936-1943), was published posthumously in 2009. The memoir covers Gorrell's experiences on the battlefields of the Spanish Civil War and the war fronts in Greece, the Balkans, the Middle East and North Africa in World War II. 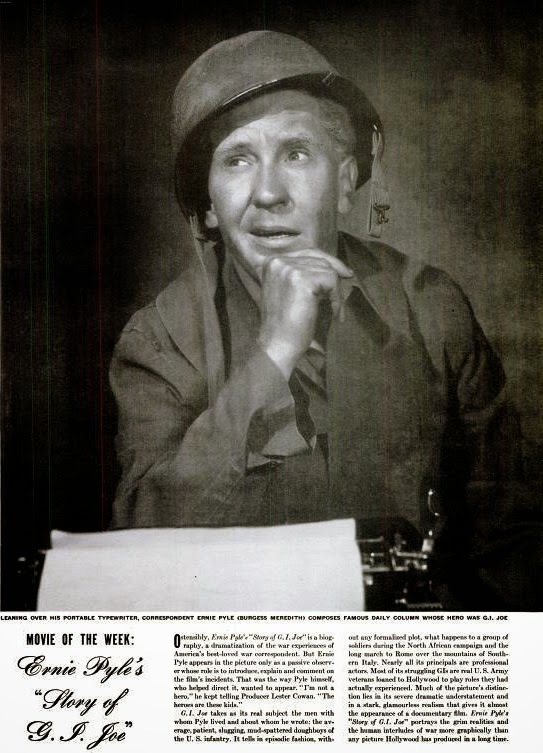 The third UP war correspondent lauded in the "Shock-Troops" ad was Leo Siewers "Bill" Disher Jr, born on February 24, 1912, in Winston-Salem, North Carolina. He died aged 57 on August 17, 1969, in Washington DC. After attending Riverside Military Academy in Georgia, Disher graduated from Duke University in 1932. He held newspaper positions on the Twin-City Sentinel of Winston-Salem and the Winston-Salem Journal. Later he was marine editor of the Charleston, South Carolina, Evening Post and joined UP in New York in 1939. 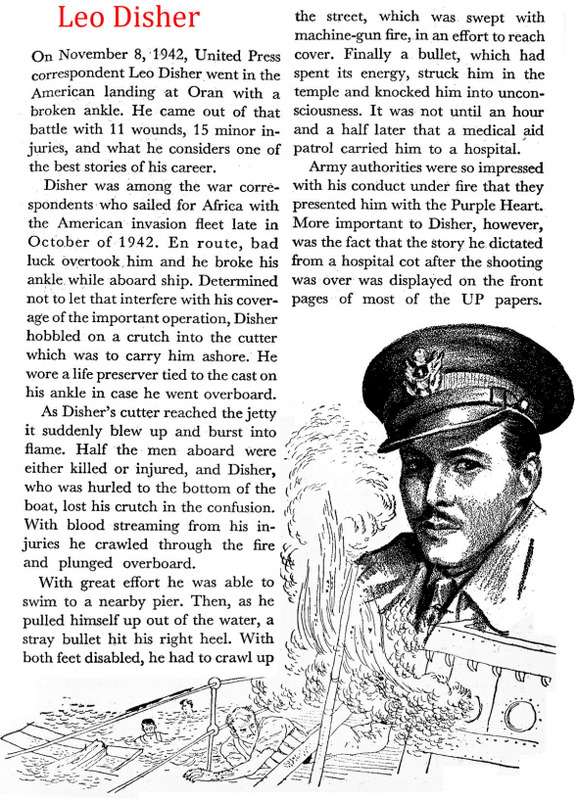 Disher was in late 1942 awarded the Order of the Purple Heart by Major General Lloyd R. Fredendall for "extraordinary heroism and meritorious performance of duty" at the Battle of Oran Harbour in Algeria on November 8, 1942. Disher was aboard a US cutter which forced the entrance to the harbour under heavy fire from shore batteries. Most of the military personnel of the ship were killed or wounded. 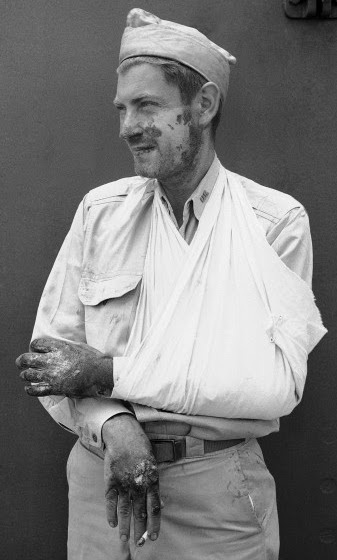 Disher suffered 11 wounds from shrapnel and bullets, as well as 15 superficial scratches. He already had a broken ankle when the action began, resulting from an earlier injury aboard ship. The award citation read, "In face of withering enemy fire, although several times wounded, Disher remained at his post on the vessel which was taking him ashore and continued to report for the public press a lucid, accurate and detailed account of the action, in which the greater part of the military and naval personnel aboard the ship be came casualties." After being ordered to abandon ship, Disher swam to shore. United Press war correspondent H.D. 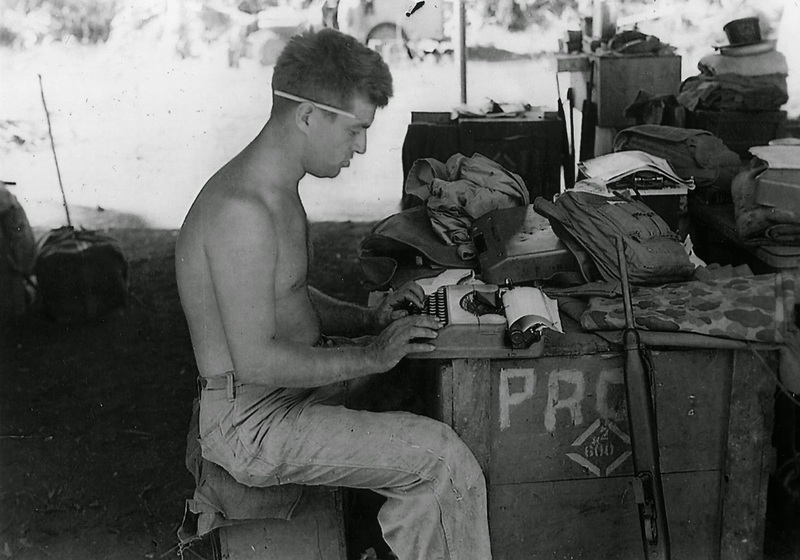 "Doc" Quigg working at his typewriter in front of a Japanese hut in New Guinea in 1944. Horace Dasher "Doc" Quigg was born in Marshall, Missouri, on November 22, 1911, and died aged 86 in Manhattan on May 12, 1998. His family moved to Boonville, Missouri, in 1914, where H.D. 's father was a physician, civic leader and mayor. Quigg's nickname "Doc" started as "Young Doc Quigg", in reference to his father's position. Quigg Jr completed bachelor of arts and journalism degrees at the University of Missouri in 1934 and started his journalism career at the Boonville Daily News. In 1936, he began working for United Press in Cleveland, Ohio, and transferred to New York City in 1937. During World War II he covered the Pacific Theatre and General Douglas MacArthur's return to the Philippines. In 1947 he travelled to Antarctica with Admiral Richard E. Byrd's expedition. Quigg was named senior editor at UPI in 1967 and retired in 1985. He was given a Society of Silurians award for distinguished reporting and the University of Missouri's Honor Medal for distinguished service in journalism. He covered a number of major court cases, including the trials of Jack Ruby, Alger Hiss, Dr Sam Sheppard and James Earl Ray. Many of UPI's feature stories about events of national interest carried his byline, such as the moon landing, the shootings from the tower of the University of Texas and the inquest into the drowning of Mary Jo Kopechne on Chappaquiddick Island. Cy O'Brien uses a Hermes Baby typewriter on Guam in 1944. Cyril John 'Cy' O'Brien was born on January 30, 1919, in St John's, Newfoundland, Canada, grew up in Camden, New Jersey, and began his journalism career as a court and police reporter for Camden's Courier-Post newspaper. In 1942 he joined the Marine Corps, serving first as an infantry scout and then as a combat correspondent. His bylined stories described the fierce fighting in the Pacific campaigns of Bougainville and Guadalcanal, as well as the US invasion of Guam, and earned him acclaim from Admiral Chester W. Nimitz. As a roving reporter with the 3rd Marine Regiment on Guam, O'Brien watched the raising of the American flag on Mount Suribachi from the beach of Iwo Jima. His articles on critical war events were transmitted by the Associated Press, UP and the International News Service to publications and broadcast networks around the world. When he died in Maryland aged 92, on January 31, 2011, US Congresswoman Madeleine Z. Bordallo described the former US Marine combat correspondent's coverage as providing America "with a unique perspective of Guam’s Liberation for all who study Guam history and World War II in the Pacific. As a leader in the 3rd Marine Division Association, O’Brien returned to Guam on many occasions for Liberation Day and to lobby in support of Guam War Claims.” He also led trips back to New Zealand, the Solomon Islands and other WWII sites. O'Brien had "captured the brutal liberation of Guam on a typewriter". At the time of his death, he was the oldest known Marine combat correspondent. Following the war O'Brien returned to the Camden Courier-Post, later becoming a feature writer for the Long Island Press in New York and then the Stroudsburg Record in Pennsylvania. He also served as a columnist for two New Jersey papers, the Trentonian and the Times-Journal of Vineland. In 1948 O'Brien moved to the Washington DC area as a congressional correspondent for the Erwin (Texas) News Service. During the Korean War he joined the Marine Corps Reserves, which he left in 1963 having earned the rank of captain and the Marine's Sibi Non Patri Award to honour his service. Meanwhile O'Brien earned a BS in English (1942) from St Joseph's College in Philadelphia and later an MS in communications (1965) from American University in Washington DC. In 1949 he began a 34-year career at the Johns Hopkins Applied Physics Laboratory in Laurel, Maryland, leading its public and media relations group. His ability to present complex technical subjects in plain language helped secure worldwide media coverage for APL programs such as the Transit satellite navigation system, the Aegis ballistic missile program and APL-built satellites that took the first images from space of the curvature of the Earth and the first colour pictures from space of the whole Earth. He covered the first launches of the Navy Navigation Satellite System from Cape Canaveral and landmark AEGIS weapons system missile firings from a Navy ship in the Pacific. He was historian for the New Jersey State Society in the late 1960s and on the Montgomery County Maryland's Bicentennial Commission in 1976. He was president of the Montgomery County Press Association in the early 1970s and of the Mid Atlantic Association of Industrial Editors from 1960-61. In 1960, he was named the MAAIE's "Editor of the Year". He was a longtime member of the National Press Club (more than 62 years), the American Newspaper Guild, and the White House Correspondents Association. O'Brien contributed to publications such as Stars and Stripes (for which he was still writing into his 90s), Leatherneck and VFW magazines, Naval Aviation News, and many newspapers. He also served as editor of the laboratory's internal newsletter, the APL News, and in 1982 he wrote much of the laboratory's anniversary book, The First Forty Years. He retired in 1983. In 2008, he delivered the keynote address at the re-dedication of the War in the Pacific National Historical Park in Guam, which commemorates the bravery and sacrifices of those who took part in the campaigns of the Pacific theatre in World War II. In 2010 the Guam legislature passed a resolution commending O'Brien for his "sacrifice and service" to the people of Guam, which also referenced two of his books: one on Guam, Liberation, and another, Two Score and Ten that includes many anecdotes from the 3rd Marine Division in Guam. 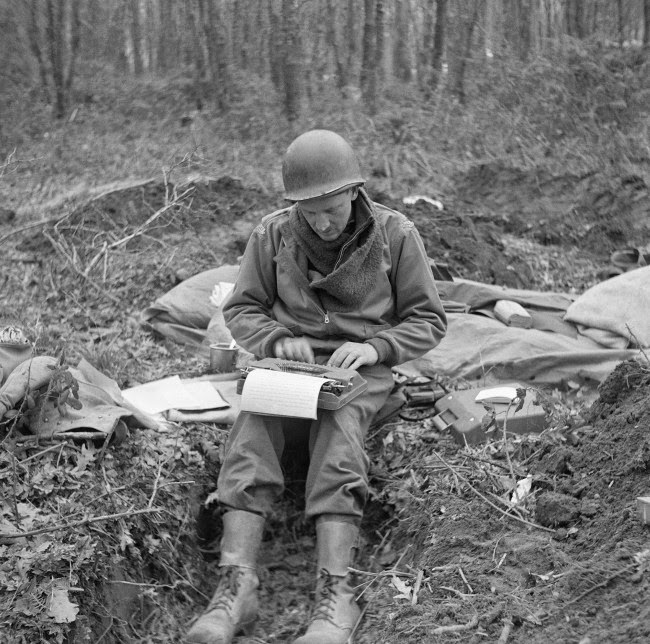 Don Whitehead of Associated Press sits in a foxhole to write his story on his Hermes Baby about the landing at Anzio Beach in Italy on February 16, 1944. 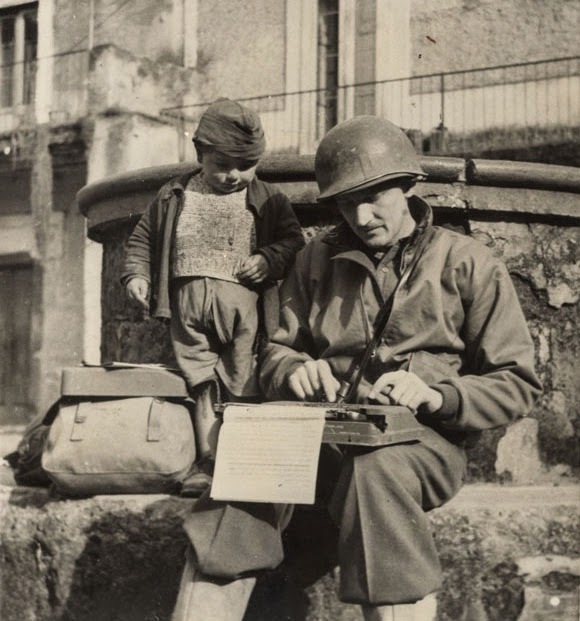 An Italian boy peeks over the shoulder of Don Whitehead as he writes a story on his Hermes Baby before embarking on the invasion of Italy below Rome. 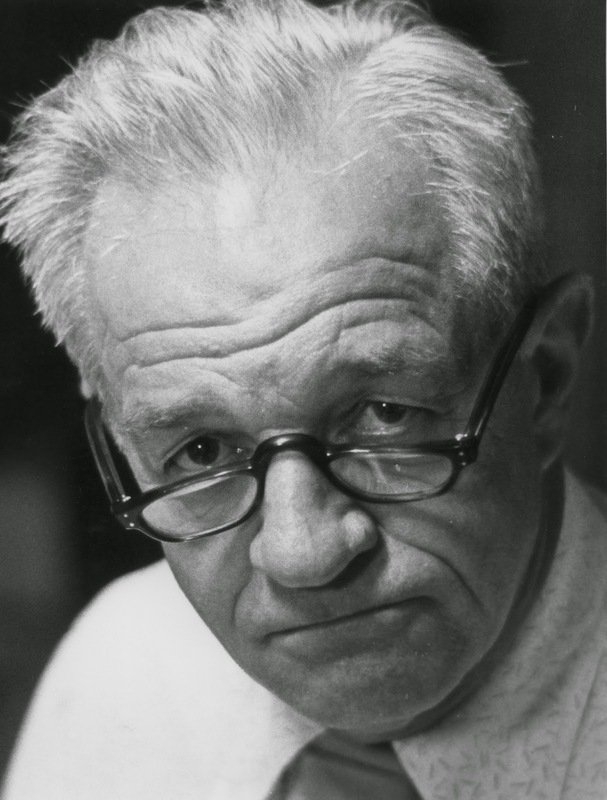 Donald Ford Whitehead was born on April 8, 1908, in Inman, Virginia. He was raised in Harlan, Kentucky, and at age 10 his first news story for the local newspaper about a murder that he had witnessed. The story was rejected because it was late. Whitehead learned an invaluable lesson about "getting the story while it’s hot", which he would use later in life. He earned his degree in journalism from the University of Kentucky in 1928. After graduating, he worked for the Lafollette Press. Whitehead then became city editor of the Harlan Daily Enterprise, covering the 1930s Harlan County labour wars. In 1934, he went to work as a reporter for the Knoxville Journal and in 1935, he joined the Associated Press as a night editor in Memphis. 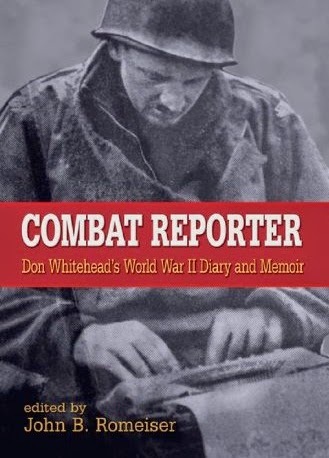 Whitehead's skill as a feature writer earned him a promotion to AP's New York bureau in 1941. In 1942 he was sent by AP to Egypt, where he was assigned to the British Eighth Army as it began its campaign against Rommell's Africa Corp. Next, Whitehead went on the invasion of Sicily and Italy. He covered the Allied invasion of Sicily at Gela with the First Infantry Division, the Allied invasion of Italy at Salerno, and the Italian campaign. He landed at Anzio in January 1944. He was then transferred from the Italian front to London to join AP's staff preparing for the invasion of France. Whitehead landed on Omaha Beach on D-Day, June 6, 1944, with the First Infantry Division's 16th Regiment. He covered the push from the beachhead, Operation Cobra at Saint-Lô, and the pursuit across France. He scored the first story on the Liberation of Paris and covered the US First Army's push into Belgium and into Germany, and the crossing of the Rhine River. He also covered the meeting of American and Russian troops on the Elbe River. 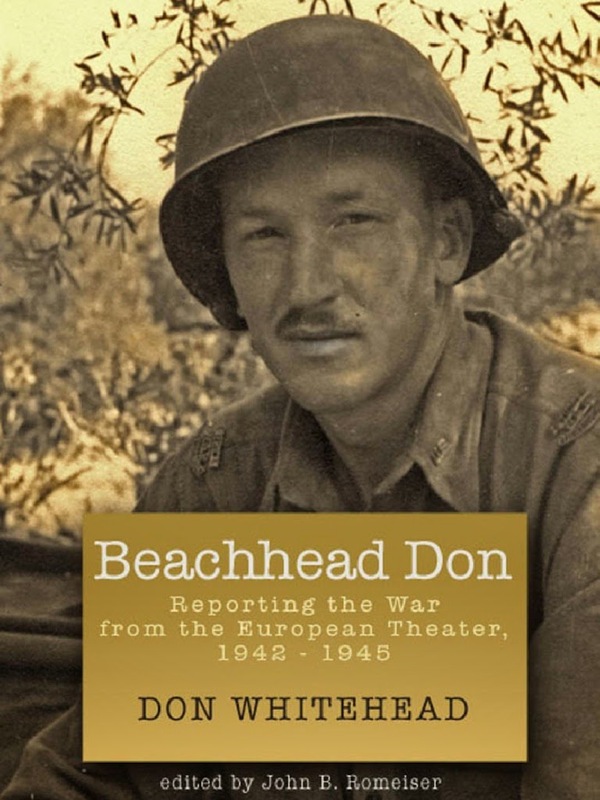 Whitehead earned the nickname "Beachhead Don" because he was present at so many allied landings, five in all. He was awarded the Medal of Freedom by President Harry S. Truman. Whitehead later covered post-war atomic testing and the Korean War in 1950. For this he was awarded the Pulitzer Prize in 1951, followed by the George Polk Memorial Award for wire service reporting. In 1952 Whitehead won another Pulitzer Prize. It was awarded for his international reporting on a secret fact-finding trip to Korea taken by President-elect Dwight D. Eisenhower. Whitehead went on to write six books, including 1956's best-selling The FBI Story, a history of the FBI from 1908 to 1955. He was Washington bureau chief for the New York Herald Tribune in 1956 and a columnist for the Knoxville News-Sentinel before retiring in 1978. His book, The FBI Story was adapted into a 1959 movie. Whitehead died aged 72 in Knoxville, Tennessee, on January 12, 1981. 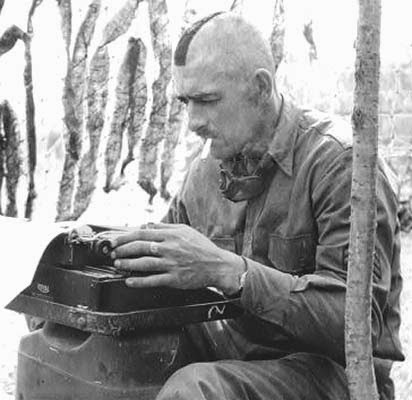 Sporting a "Mohawk" haircut, Sergeant Frank Woolner, above, works his Royal portable typewriter on top of a petrol can during the winter of 1944-45, somewhere in Belgium or Germany. Francis Mathews Woolner was born in Worcester, Massachusetts, on October 8, 1916. He died aged 77 in Shrewsbury, Massachusetts, on August 11, 1994. 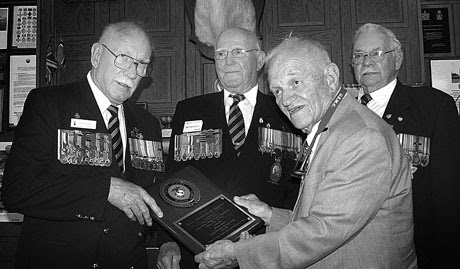 Woolner saw frontline combat action during 1944 as a reconnaissance sergeant with the 703rd Tank Destroyer Battalion of the 3rd Armoured Division through France and Belgium. He also served as the battalion's chief writer for press and historical purposes, as he had in 1942-44 during the 703rd's training in the US and England. In September 1944, Woolner was promoted to the division headquarters G-2 Section (intelligence and public affairs). There, he went to work for Lieutenant Colonel Andrew Barr and Major Haynes Dugan as a war correspondent, historian and observer. When the war ended in May, 1945, Woolner stayed in occupied Germany with a headquarters production staff to research and publish the 3AD history Spearhead in the West. Woolner was the author of the main narrative of the book, which would become a military classic and is a collector's item today. He returned to the US in the fall of 1945. Woolner became a nationally recognised expert on ocean and fresh-water sport fishing. He was also an authority on hunting, natural history and conservation in New England. Woolner was also a newspaper columnist. Associated Press war correspondent Vern Haugland was listed as missing on August 12, 1942, after a plane in which he was passenger disappeared in a storm between Australia and New Guinea. Vernon Arnold Haugland was born on May 27, 1908, in Litchfield, Minnesota. In 1913, the family moved to a ranch in Meagher County, Montana. After graduating from Gallatin High School, Haugland attended the University of Washington for two years, and finished his degree at the State University of Montana in Missoula in 1931, receiving his BA in Journalism. He then worked for two years with the Missoula Sentinel and the Daily Missoulian. In 1933 he moved to Butte, Montana, and worked as a general reporter for The Montana Standard, and in 1936 Haugland joined Associated Press Salt Lake City bureau. Two years later he transferred to the Los Angeles bureau. While there he was given the assignment of dating the 10 most eligible ladies of Hollywood. When the Japanese attacked Pearl Harbor on December 7, 1941, Haugland volunteered for overseas duty. He was the first AP reporter to arrive in Brisbane, Australia. On August 7, 1942, the B26 bomber, the Martin Marauder, that Haugland was travelling in ran out of fuel, forcing him and the crew to bail out over New Guinea. Haugland was lost in the New Guinea jungle for 47 days. For most of that time he wandered, often alone. He wrote a book, Letter From New Guinea, about his experiences in 1943. 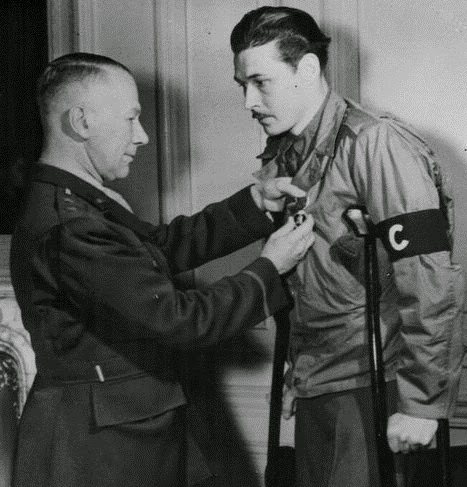 In recognition for his heroism, General Douglas MacArthur pinned a Silver Star on Haugland on October 1, while he was still delirious from starvation and exhaustion. Haugland was the first civilian to receive the Silver Star. After recovering, he continued to cover the war in the Pacific. Towards the end of the war, Haugland became an air correspondent with AP and was in a special group of correspondents who were the first to arrive in Shanghai and visit Hiroshima and Nagasaki after the dropping of the atomic bombs. At the end of the war, he was assigned to cover the Indonesian Revolution. Haugland was assigned to AP's Washington bureau and in 1951 took over as aviation editor, a job he held for the next 21 years. Starting in the 1950s until his retirement, he covered the NASA space program. NASA called him "the world's most experienced splashdown reporter". Haugland retired from AP in 1973 and moved to San Clemente, California. Haugland never retired from writing, however. He wrote two books on the Eagle Squadrons, a group of American men during World War II who flew for the British before America entered the war. He was finishing the third book when he died in Reno on September 15, 1984, aged 76. His wife finished the book for him. 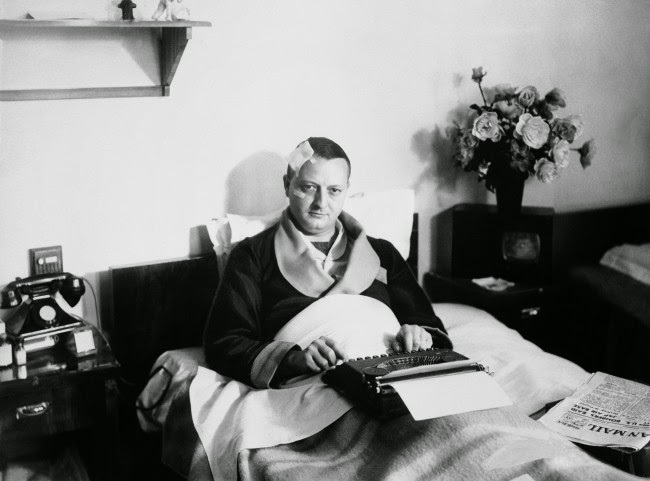 Larry Allen, Associated Press war correspondent who almost lost his life before being rescued in the Mediterranean after the British cruiser Galatea was sunk in mid-December 1941, is shown in bed in an Alexandria, Egypt, hospital on January 28, 1942, typing out the story of his experience. Laurence Edmund Allen was born in Mount Savage, Maryland, on October 19, 1908. After attending schools in several states he began his career in 1926 on the Baltimore News. In later years he was a reporter for the Washington Herald and Associated Press. He served as a European war correspondent from 1938 to 1944, writing from warships in the Mediterranean and winning a Pulitzer Prize for his reporting in 1942. He was held in a Nazi prison camp for eight months. After the war, he covered the Communist takeover of Poland. Allen then moved to Moscow in 1949 where he headed the Associated Press news bureau, and the next year held the same post in Tel Aviv. War coverage was Allen's special forte, so in 1951 he headed for South-East Asia, where he wrote about the French-Indochina War and was present at the battle of Dienbenphu. By 1957 the Caribbean had become a world trouble spot and Allen shifted his focus to the Castro takeover in Cuba. In 1960 he became head of the American Press Service, which specialised in Latin American news coverage. He died aged 66 in Mexico City on May 12, 1975. David Greendrug Wittels, seen above typing in New Guinea during the Pacific War, was born on April 22, 1905, in Camden, New Jersey, and died aged 71 in 1976 in Upper Darby, Pennsylvania. After the war he became an investigative reporter for the Philadelphia Record and a writer for the Saturday Evening Post. He was also involved in radio work. 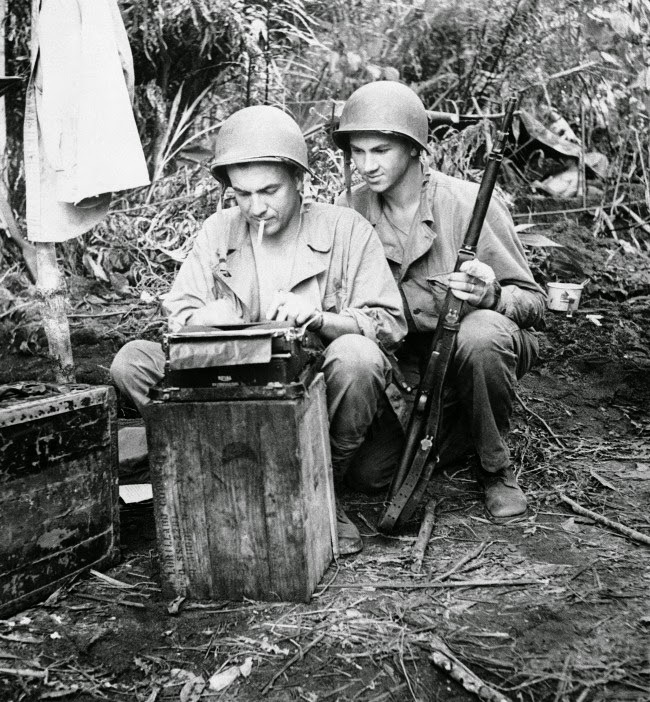 Master Sergeant John A. Kutcher, of Portland, Oregon, looks on as Associated Press correspondent Bill Boni, of New York, works at his Royal portable typewriter somewhere in New Guinea on August 5, 1943. Boni was awarded the Purple Heart decoration in recognition of wounds received on July 9 when the barge on which he was a passenger was strafed by machine guns and cannons off Nassau Bay on the New Guinea coast. William Frederick Boni was born on June 14, 1910, in Drachen, Holland, and died aged 85 on September 15, 1995, in Springfield, Vermont. He was a sportswriter-turned-war correspondent. His book, Want To Be a War Correspondent? Here's How ..., which recounted his wartime experiences, was published in 1995. His family settled in the US when he was five and he began covering sports for the New York Evening Post in 1935. He took a sportswriting job at AP two years later and became AP's domestic military editor in 1942. Later that year he went to Australia as an AP war correspondent. He also covered battles in China, Burma, India and Europe. 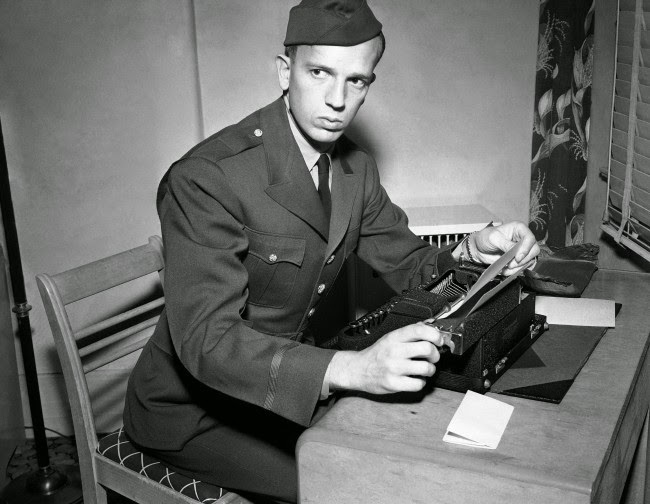 After the war, Boni established the AP's bureau in Amsterdam, then left to become sports editor for the military newspaper Stars and Stripes in 1946. 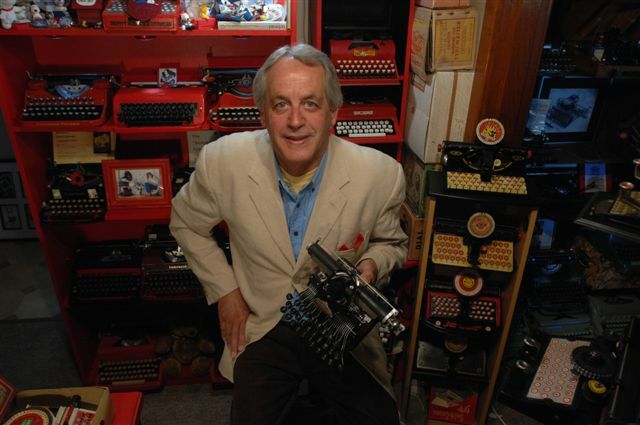 He later wrote about and edited sports for newspapers in Seattle, Spokane, Washington, and St Paul, Minnesota, before joining his father's publishing firm in Vermont. 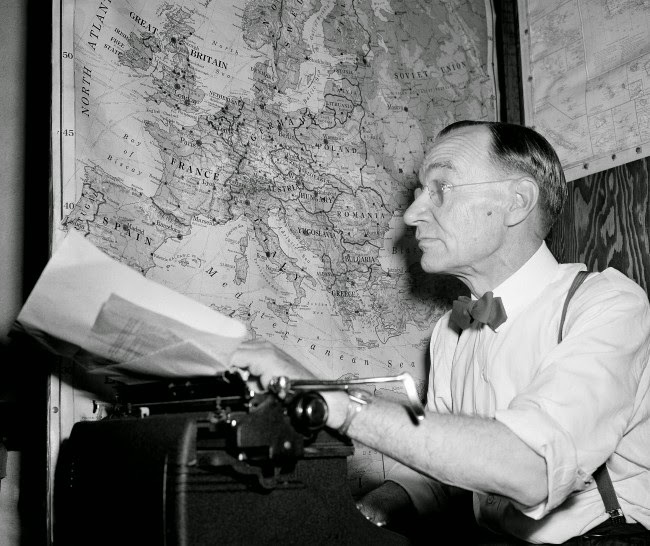 Kirke L. Simpson, Associated Press war analyst and Pulitzer Prize winner, sits at his typewriter and his maps to study the day’s war dispatches and report for Associated Press member newspapers on September 2, 1943. Kirke Larne Simpson was born on August 14, 1881, in Pasadena, California. He died, aged 90, on June 16, 1972, in Los Gatos, California. He was an AP man in San Francisco and Washington for 37 years. His 1921 story on the burial of the Unknown Soldier won the first AP byline and the first Pulitzer Prize ever awarded a news service man. It still appears in journalism textbooks. For many years he was AP's Washington political columnist. He broke the news of Teddy Roosevelt' Bull Moose campaign, and made "smoke-filled room" a potent political phrase. Simpson retired in 1945. 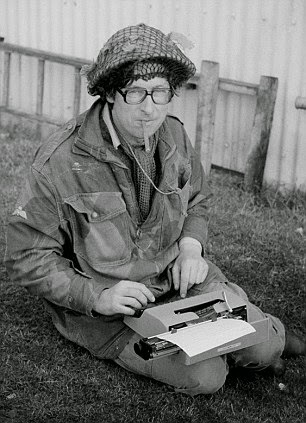 Bob Miller wasn't allowed to cover the Falklands War, deemed too old at 67 in 1982, but Max Hastings (now Sir Max) did get there, with his Olivetti Lettera 32 portable typewriter. Max Hugh Macdonald Hastings was born in Lambeth, London, on December 28, 1945. A noted British journalist, editor, historian and author, he is the son of Macdonald Hastings, a journalist and war correspondent. Hastings was educated at Charterhouse School and University College, Oxford. He then moved to the US, spending a year (1967–68) as a Fellow of the World Press Institute. Hastings became a foreign correspondent and reported from more than 60 countries and 11 wars for BBC TV's 24 hours current affairs program and for the Evening Standard in London. Hastings was the first journalist to enter the liberated Port Stanley during the Falklands War. After 10 years as editor and then editor-in-chief of The Daily Telegraph, he returned to the Evening Standard as editor in 1996 until his retirement in 2002. He received a knighthood in 2002. He is the author of many books, including Bomber Command, which earned the Somerset Maugham Award for non-fiction in 1980. Both Overlord and The Battle for the Falklands won the Yorkshire Post Book of the Year prize. Hastings was named Journalist of the Year and Reporter of the Year at the 1982 British Press Awards, and Editor of the Year in 1988. In 2010 he received the Royal United Services Institute's Westminster Medal for his "lifelong contribution to military literature", and the same year the Edgar Wallace Award from the London Press Club. In 2012 he was awarded the $100,000 Pritzker Military Library Literature Award, a lifetime achievement award for military writing, which includes an honorarium, citation and medallion, sponsored by the Chicago-based Tawani Foundation. Hastings writes a column for the Daily Mail and often contributes articles to other publications such as The Guardian, The Sunday Times and The New York Review of Books. 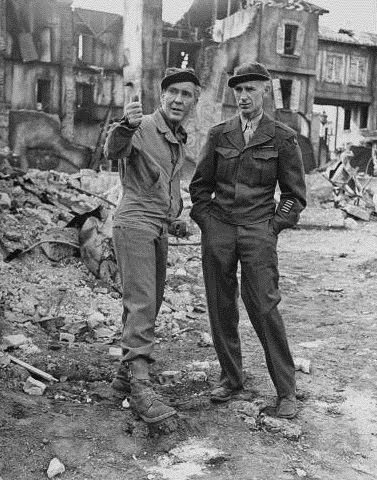 BELOW: This is not a war correspondent, but Burgess Meredith playing Ernie Pyle in The Story of G.I. Joe, also credited in prints as Ernie Pyle's Story of G.I. Joe, a 1945 American war film. The film was nominated for four Academy Awards, including Robert Mitchum's only nomination, for Best Supporting Actor. The story is a tribute to the American infantryman ("G.I. Joe") during World War II, told through the eyes of Pulitzer Prize-winning war correspondent Pyle, with dialogue and narration lifted from Pyle's columns. Meredith and the real Pyle are seen together below during filming. Burgess did serve in the war, in the US Army Air Forces, reaching the rank of captain. He was discharged in 1944 to work on the movie. One of Us Had to Go!